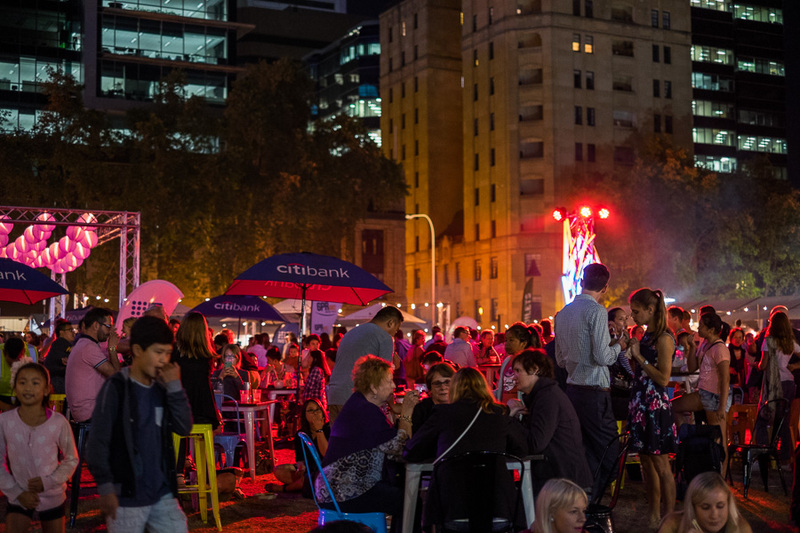 Perth is in danger of suffering food festival fatigue. In recent times, it seems like the number of food events has exploded. 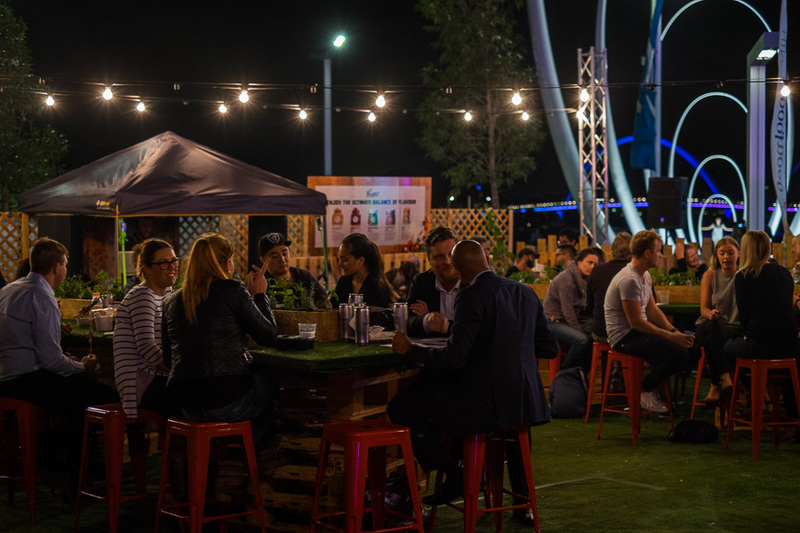 We’re in the middle of the City of Perth’s Eat Drink Perth (encompassing more than 90 events between 16 March to 23 April), which isn’t affiliated with Fairfax’s Good Food Month (30 March to 30 April), which has brought the Night Noodle Markets back to our city (30 March to 10 April). 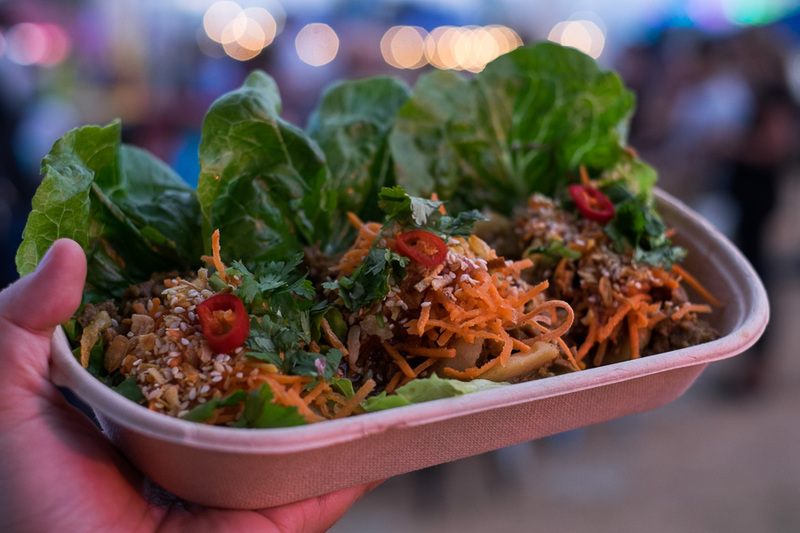 Tomorrow (3 April) we’ve got the third Perth Food Truck Rumble at the Perth Cultural Centre from 11am, with the Night Noodle Markets at Elizabeth Quay from 4pm. Last night, when the queues got ridiculously long just to enter the Night Noodle Markets, I bumped into friends who were contemplating legging it back to Forrest Place to grab sweets at the Twilight Hawkers Market’s Dessert Garden – the Twilight Hawkers Market is on every Friday until 29 April. 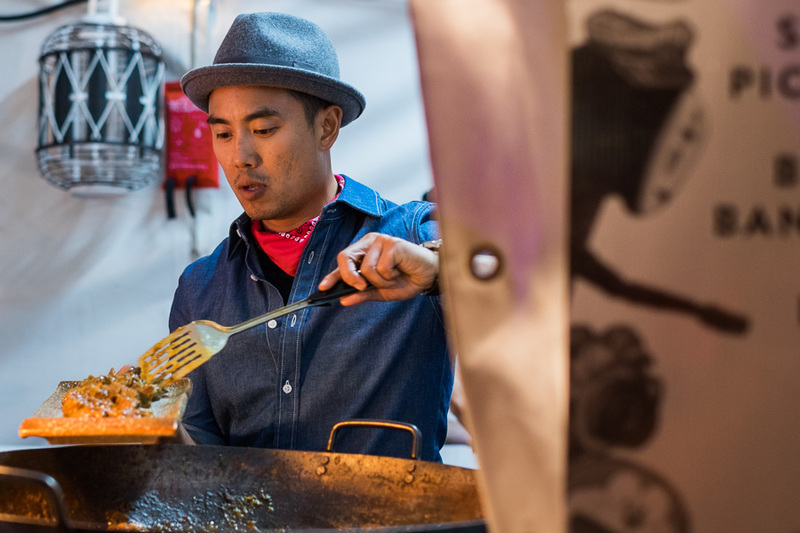 And don’t forget, Taste of Perth will be back at Langley Park from 29 April to 1 May. I’m not complaining; it’s amazing to have so much happening in Perth. I just wonder if the pressure on appetites, wallets and energy levels is sustainable. I guess winter will swoop in and stop the madness. 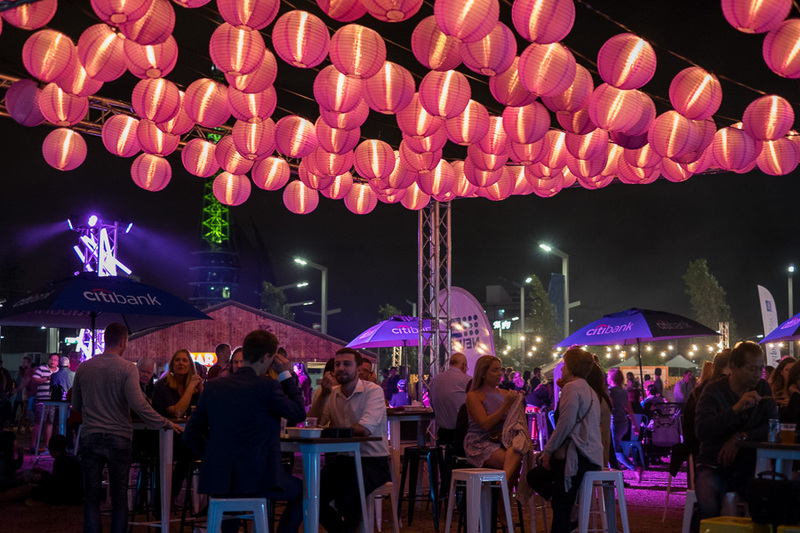 Last year, the Night Noodle Markets were held at the Perth Cultural Centre; I think holding this year’s event at Elizabeth Quay was a good move. 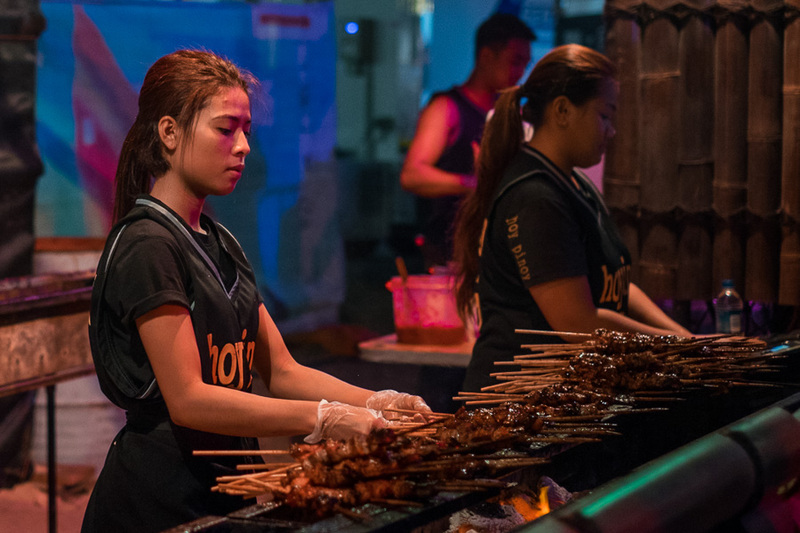 It’s a more open space that allows a better layout, although when the crowd hits its peak after sunset, the queueing and congestion around stalls can’t really be avoided. Thursday night was surprisingly quiet, much to the concern of the stallholders I spoke with, but on Friday night by the time I left at 7.15pm, not only was it hectic around the stalls, the line of people just waiting to get in through the gate was longer than the full width of the Night Noodle Markets. Good for the stallholders, who were probably too flat-out to notice, but somewhat disheartening for those hungry punters just arriving. More seating was needed. The experience would be greatly improved for many if there were more spaces available to sit and eat your food. On both nights I attended, I was forced to eat most of my food either standing or walking, and as the crowd surged, it became increasingly difficult to find suitable places out of the way to stand and eat. 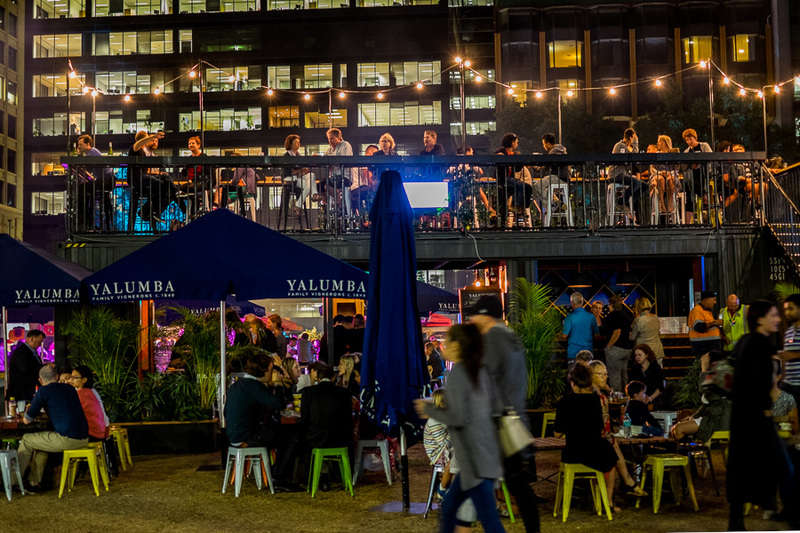 Below are scenes from the Night Noodle Markets, along with the food I tried on Thursday and Friday nights when I attended on my own. Not all the 20+ stallholders are represented in the pictures below, and I can only eat so much! Despite the issues I’ve mentioned above, I had an awesome time and if possible, hope to squeeze in at least one more visit next week – if I make it, you can bet I’ll be there as soon as the gates open and will bring a friend or two to help ‘chope’ a table and share more dishes. 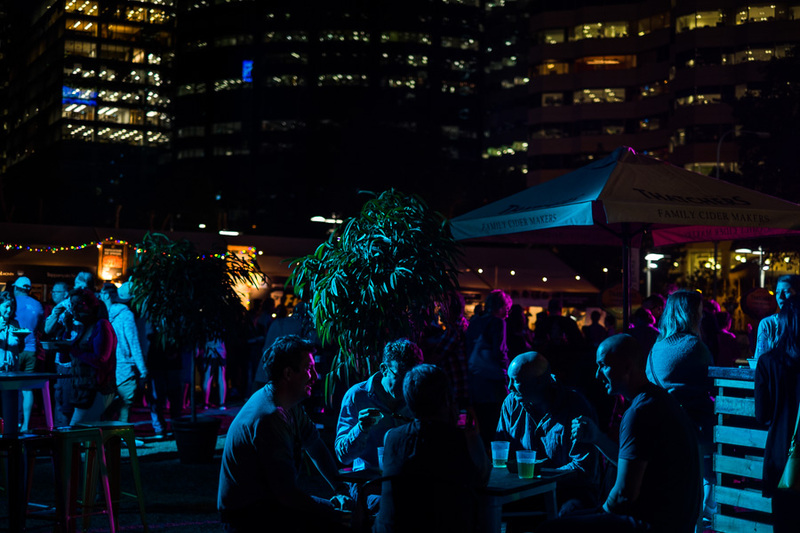 Every night at Elizabeth Quay, Perth city from 30 March until 10 April. 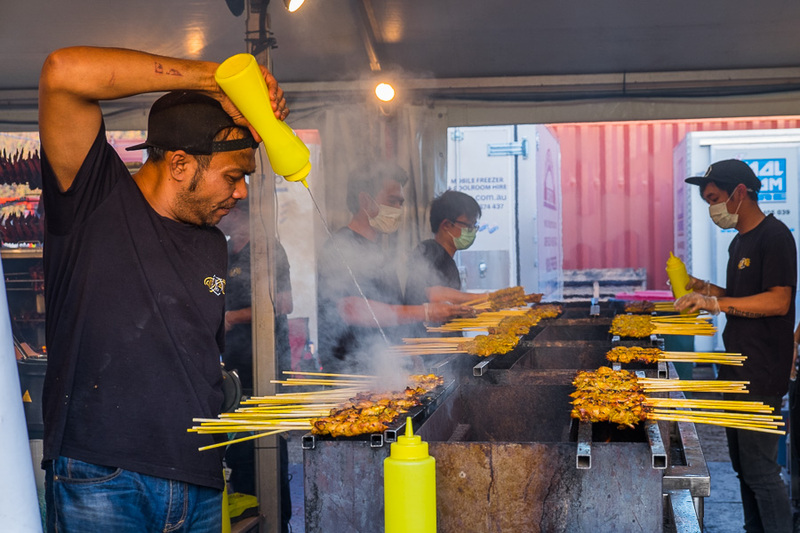 The first thing to accept is that the event is called the Night Noodle Markets, but most of the dishes on offer do not feature noodles. At Roti Road, it’s all about chicken wings and satay. These guys are from Footscray, Melbourne. At least half of the NNM line-up is from the Eastern states. Olio’s – their grilled chicken looked and smelled great. If I manage to make it down another time, I’ll give it a try. 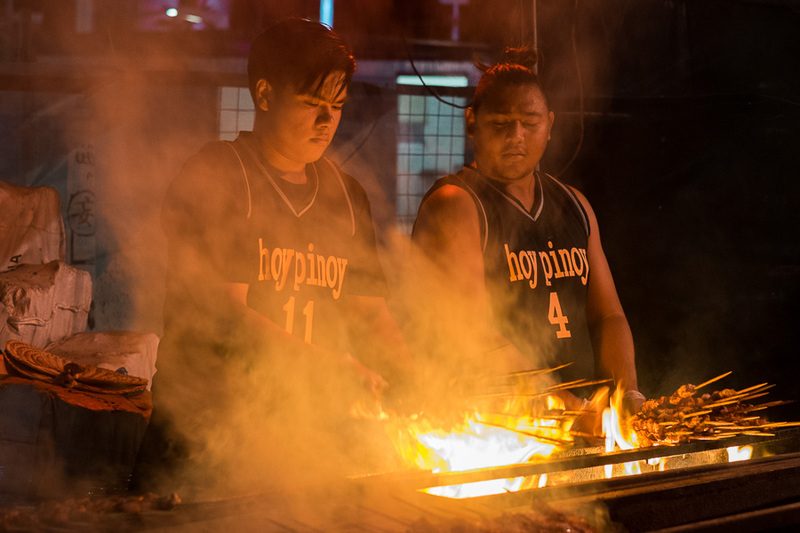 There are five Filipino stalls at this year’s Night Noodle Markets – Olio’s, Banana Leaf, Mr YummmO, Marlou’s Asian Kitchenette and Hoy Pinoy BBQ. 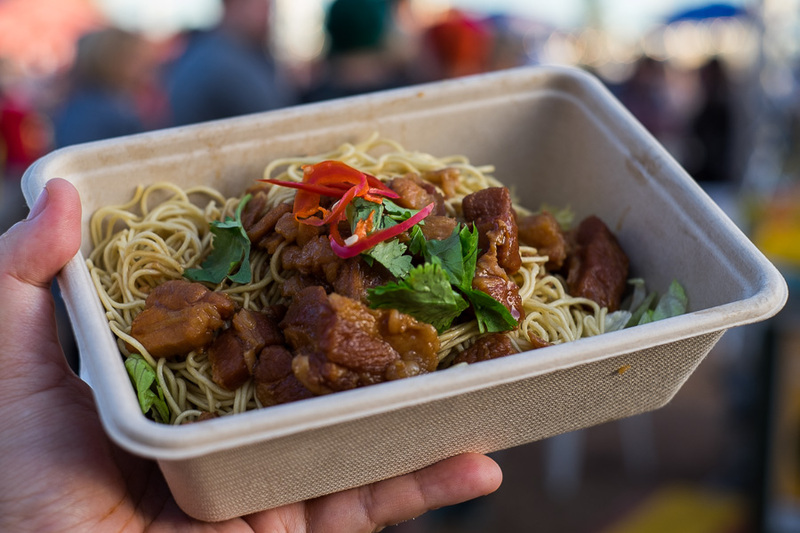 Bao, noodles and curry are on Lucky Chan’s Laundry + Noodlebar‘s menu. 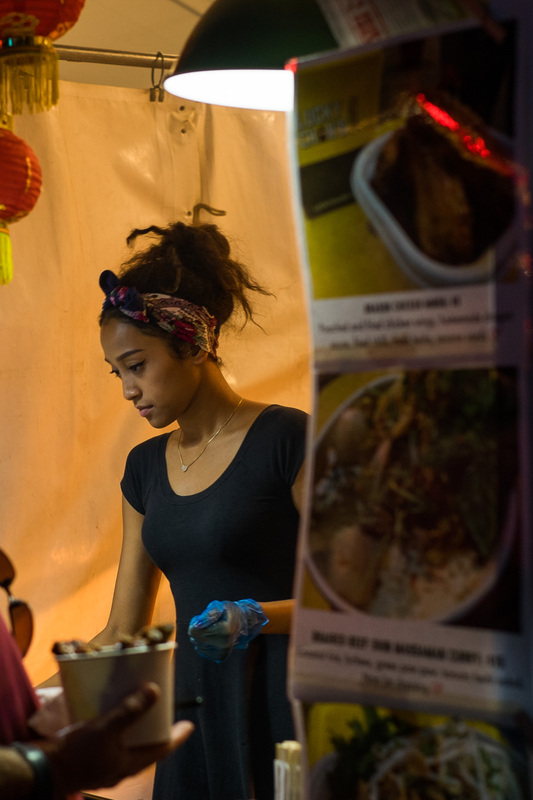 Bao’s all the rage at the markets, but I guess ‘Night Bao Markets’ just doesn’t have the same alliterative appeal! Only Mei of Turban Chopsticks can tempt me for a taste of her vegetarian menu (90% vegan – only their potato kofta balls dish is not vegan) when I’m surrounded by meat. This time, I tried her Lettuce Cups (AU$12) with Thai green spiced soya mince, chestnuts, fresh herbs and fried shallots. I ate it with a fork (can’t pick up like sang choy bow) – I liked the crunch of chestnuts and gentle Thai green burn with a touch of sweetness. Probably the healthiest dish I ate all week! 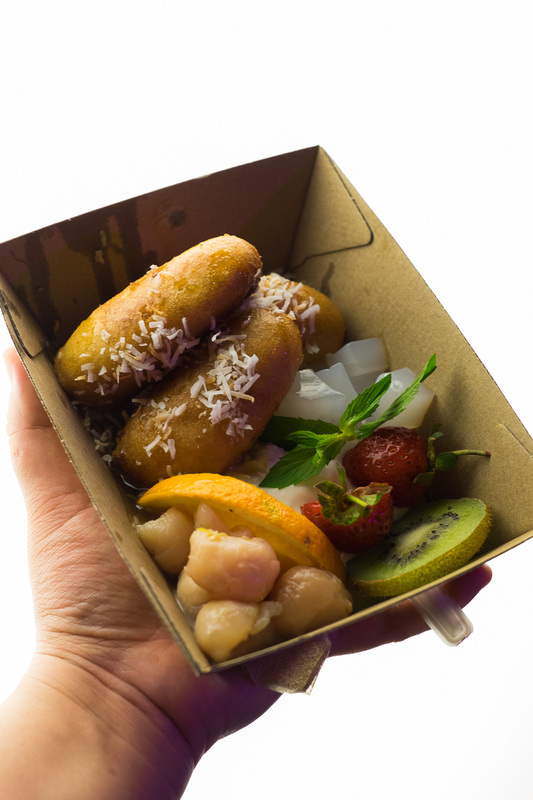 But what I really liked was Turban Chopsticks’ vegan dessert, the Tropical Liz Banana Fritter Bowl (AU$10) with freshly fried banana fritters, lychees, coconut yoghurt and coconut jellies. 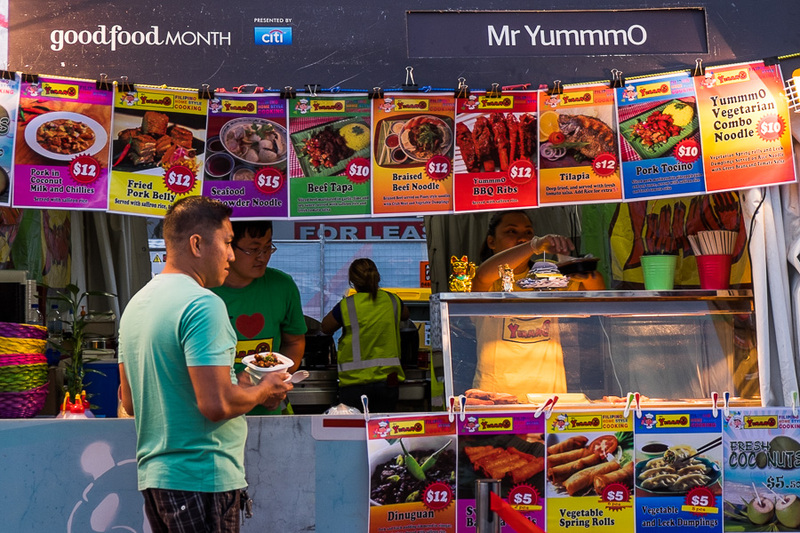 Another local stall, by Dainty Dowager and Low Key Chow House – their slow-braised beef jungle curry was highly recommended to me by two friends I ran into separately – another dish for my list if I can get to the NNM another time. That’s the beauty of a 12-day event with free entry – you can go back multiple times if you want, and work your way through the stalls. 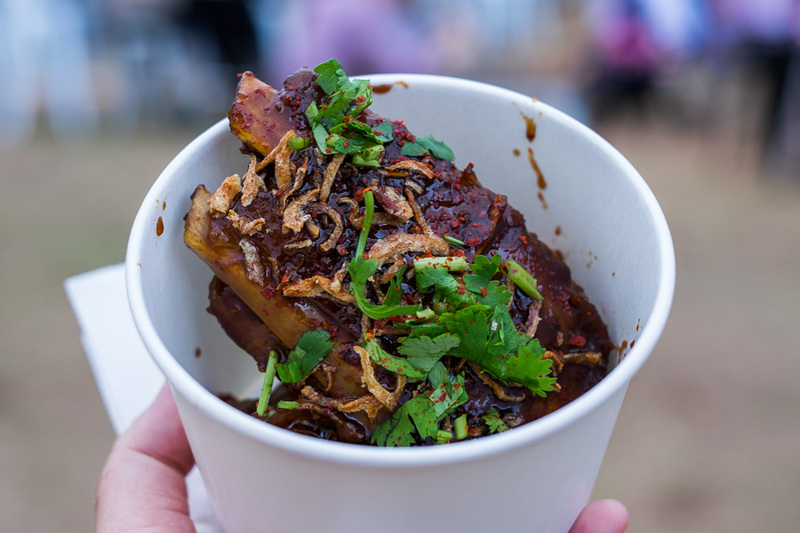 Some of the best ribs I’ve eaten in Perth have come from The Apple Daily Bar & Eating House and their Linley Valley pork spare ribs (AU$12) with tamarind, chilli and coriander were deliciously tender and tangy. Don’t forget to grab napkins for your sticky fingers. 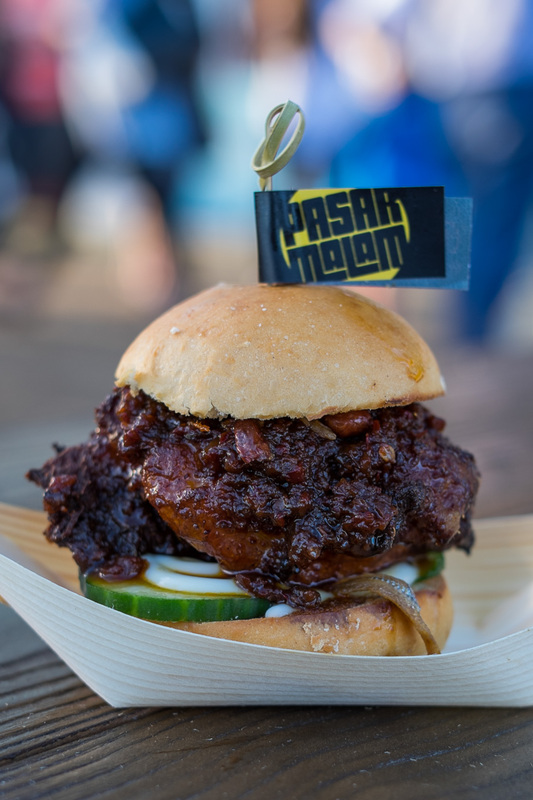 Pasar Malam‘s got four sliders on their menu – Nasi Lemak, Pork Satay (on an eye-catching black brioche bun), Chilli Crab and Tofu Bakar – buy individually or get all four for AU$40. These guys are also from Melbourne. My Nasi Lemak slider (AU$10), with a succulent piece of crispy boneless nyonya fried chicken, onion sambal, fried anchovy and peanuts and cucumber on a brioche bun. Yes, the flavours reminded me of nasi lemak. The sambal has a decent kick. There’s no elegant way to enjoy this and you will definitely need napkins for your hands and face. Shallot Thai are also from Melbourne. Their noodles were in high demand. Mr YummmO’s deep fried tilapia served with fresh tomato salsa caught my eye. Another one on my list to try another time. These guys are from Perth. 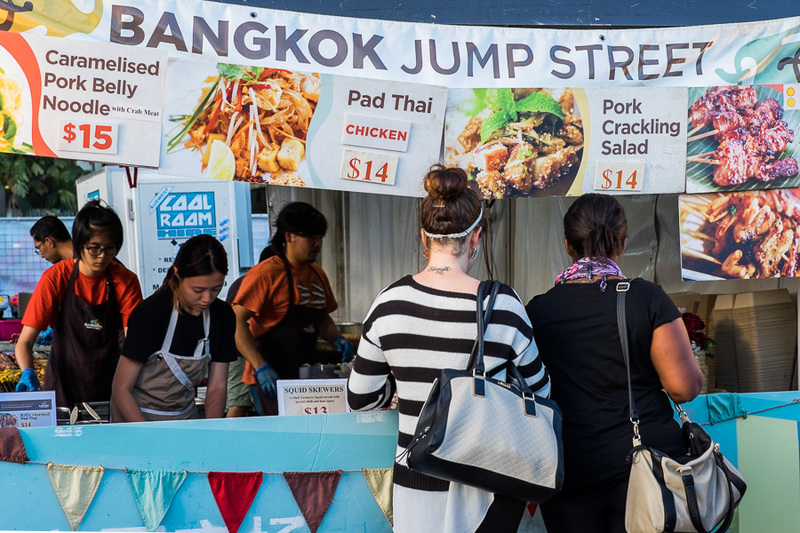 Bangkok Jump Street are a Perth market favourite. 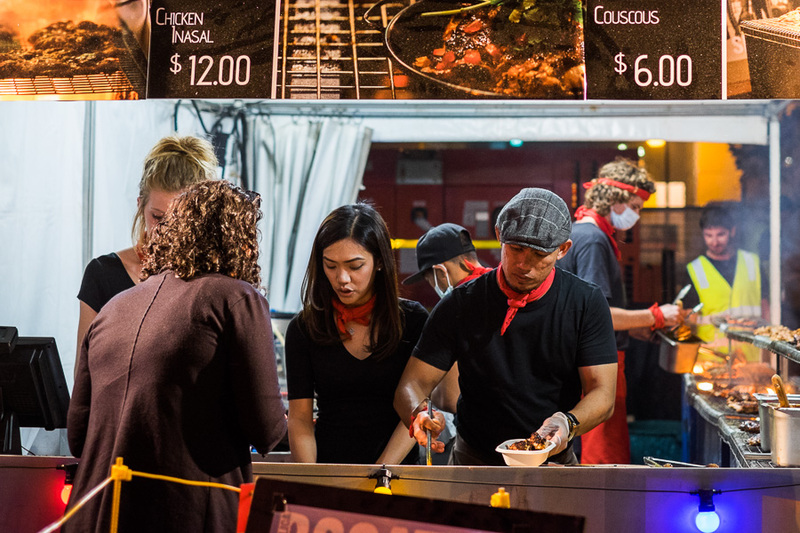 They’re a Twilight Hawkers Market regular and will be at the Food Truck Rumble this year. I love their pork crackling salad and usually order that, but in the spirit of being at a so-called ‘noodle’ market, ordered the caramelised pork belly noodles. Bangkok Jump Street’s caramelised pork belly noodles (AU$15), topped with fresh coriander and chilli, also includes crab meat. I ordered mine without the crab as over the past couple of years I seem to have developed an allergy to crustaceans. More on that another time… I enjoyed these saucy, salty noodles and the chunks of sweet juicy pork belly. There’s fresh chopped lettuce at the bottom which soaked up the sauce beautifully. 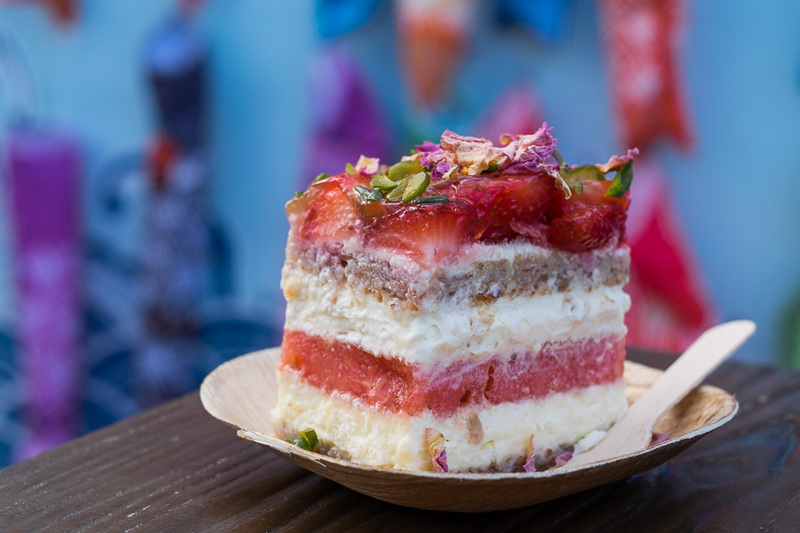 An instant Instagram hit, Black Star Pastry‘s signature Strawberry Watermelon Cake (AU$9) has been on my To Eat list for a while now. 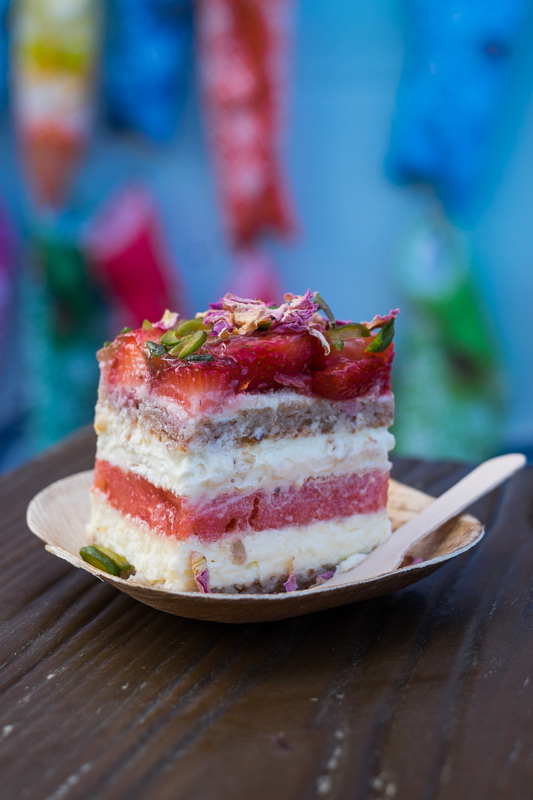 It’s an absolute stunner with almond dacquoise, rose-scented cream, strawberries, watermelon, dried rose petals and pistachios – according to Black Star’s website, gluten-free. It’s remarkably balanced, incredibly moist and not at all too sweet, and the magical watermelon layer delivers a spectacular cool, crisp burst. These guys are here from Newtown, Sydney just for our Night Noodle Markets. 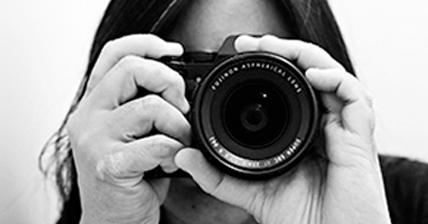 Yes, it’s $9 – but that’s cheaper than buying a plane ticket to Sydney, right? Black Star Pastry shares their stall with N2 Extreme Gelato who have stores in Sydney and Melbourne – I’ve been to N2 in Melbourne. 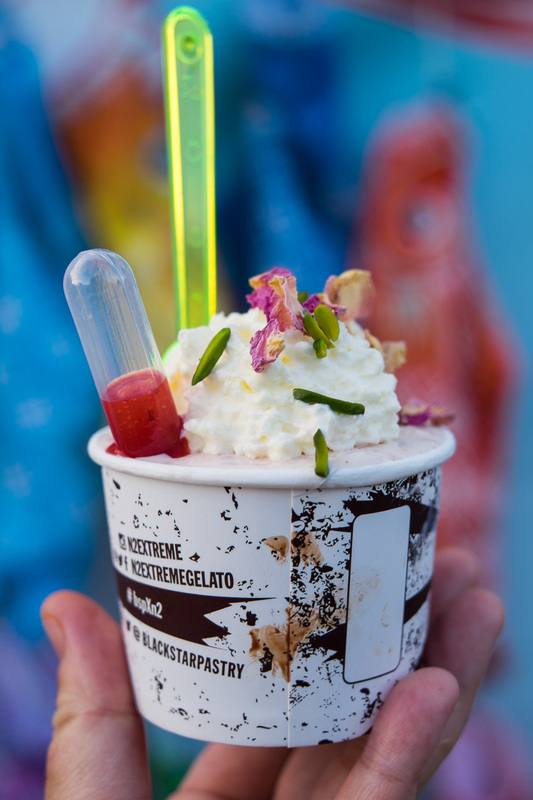 The Cake Smash gelato (AU$9) is N2’s frozen version of Black Star’s famous cake, topped with whipped cream and garnished with dried rose petals and pistachios. It’s predominantly rose-flavoured with bits of strawberry and melon, but if I had to choose one, there’s no question – the cake is the masterpiece that’s well worth trying. Also from N2 is the Ferrero Reveal (AU$9) with a Rice Bubble choc top and chocolate-filled syringe. 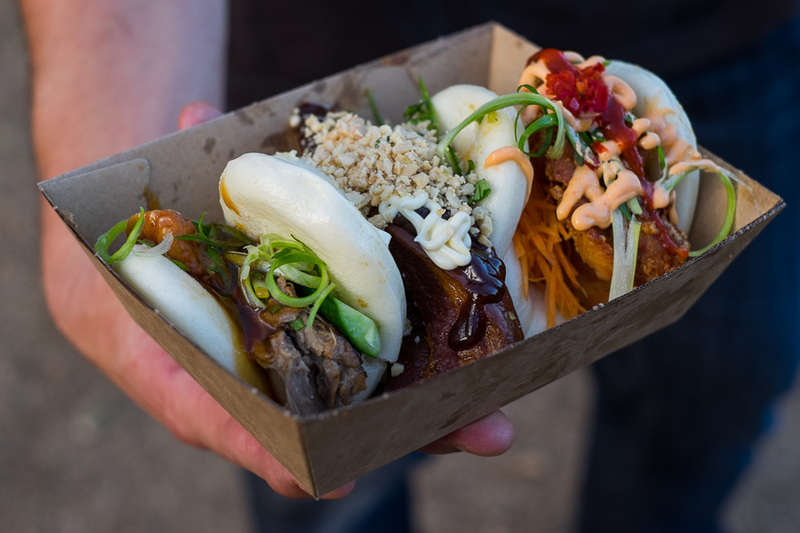 Another social media darling, Sydney’s The Bao Stop‘s Bao Trifecta (AU$20) – pork belly, fried chicken and Peking duck bao. I didn’t eat these – I bumped into friends who happily let me photograph their bao. 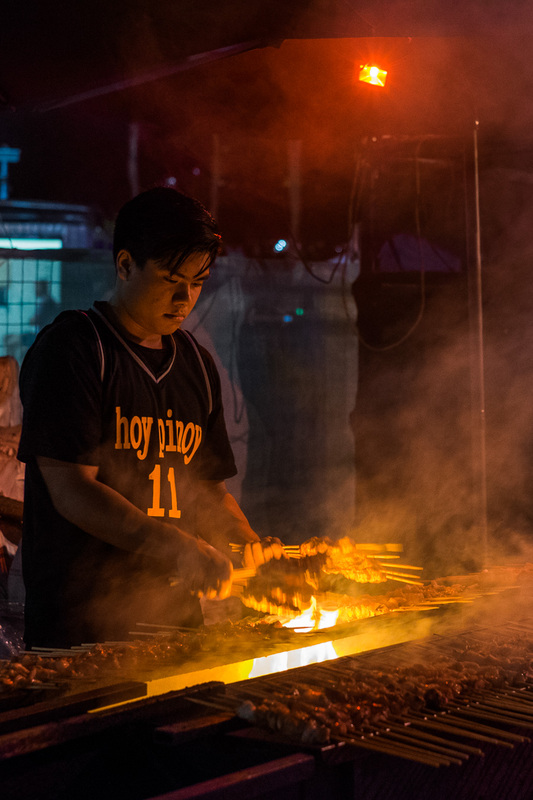 Last year’s runaway hit, Melbourne’s Hoy Pinoy, grilling skewers to feed the masses – BBQ chicken in a traditional marinade (AU$13 for two) or BBQ pork belly with banana ketchup glaze (AU$13 for two). Pork belly’s my pick. If you’re keen, I strongly recommend getting in early, as this is the stall with the showstopping queue. I watched and photographed these guys for a fair while and went home with my hair smelling like Hoy Pinoy BBQ smoke. 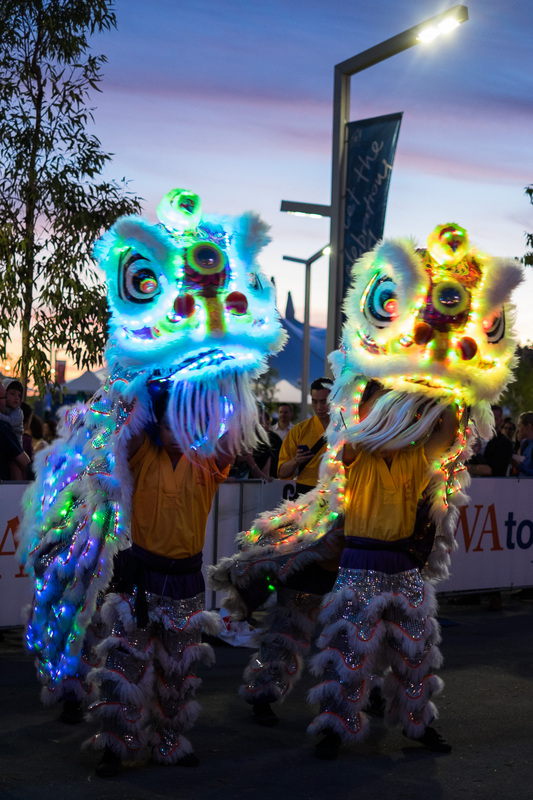 Lion dancers with twinkling lights entertained the crowd after sunset. 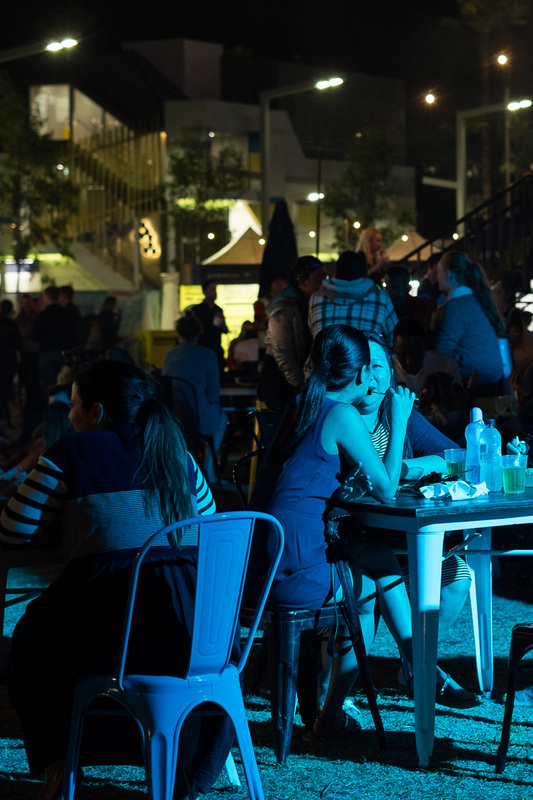 The Coopers Bar is one of the Night Noodle Markets’ pop-up bars. The Lantern Garden is right at the centre of the grounds. The Yalumba Bar’s got an upstairs deck. Disclaimer: I paid for all the dishes I ate – except the two items from Turban Chopsticks. 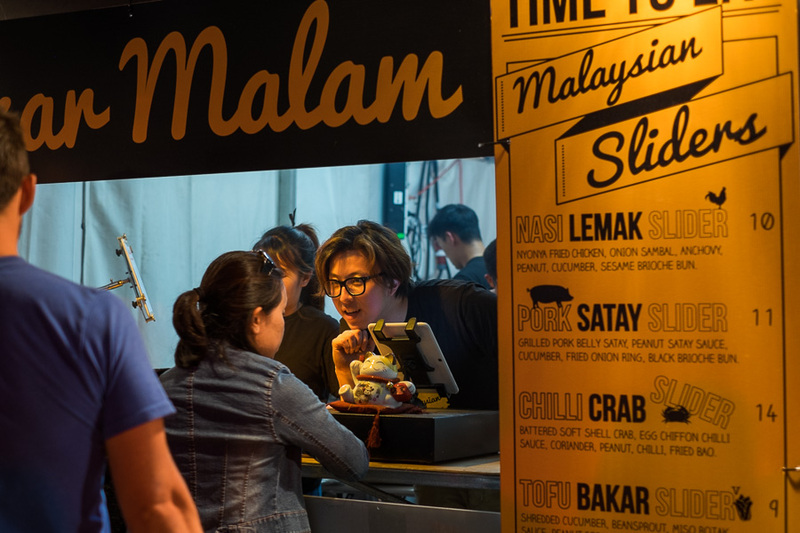 My three favourite items were Black Star Pastry’s Strawberry Watermelon Cake, Pasar Malam’s Nasi Lemak Slider, and The Apple Daily’s Linley Valley pork spare ribs. Thanks for reading. 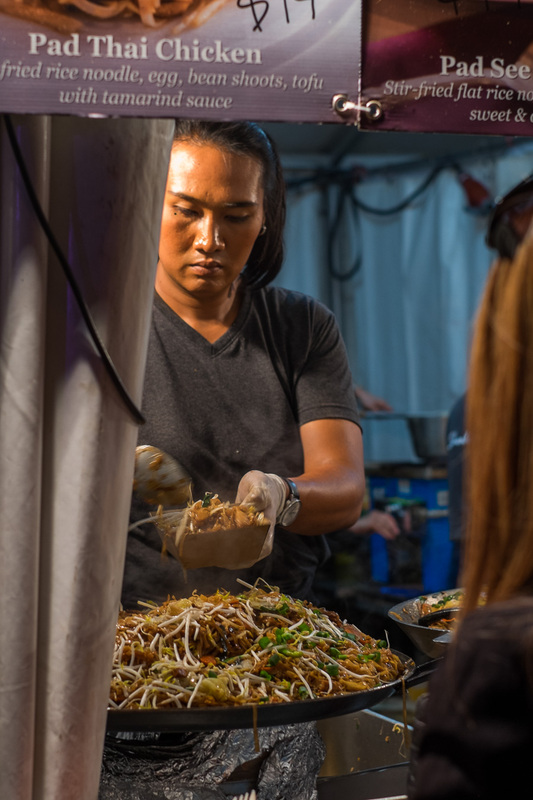 If you went to the Perth Night Noodle Markets, I’d love to hear what you thought (and what you ate).